1. Contact TacticalTECH1 Customer Service for a Return Authorization Number. Any returned item received without a return authorization number, may take additional time to inspect and credit the account. 2. Return Authorizations must be requested within 5 days of receipt and be received at our Warehouse within 20 days of shipment. Returns requested after 5 days are subject to a 15% restocking fee. 4. 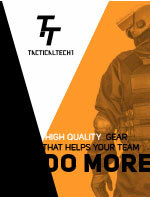 Most Items sold by TacticalTECH1 are Life Safety Equipment. Products returned after 30 days from original shipment may not be eligible for return credit. All products must be returned in original condition with original packing and any instructions or paperwork included. 6. Returns caused by a TacticalTECH1 error will be exchanged or full credit given. Returns due to customer error may be subject to a 15% restocking fee PLUS cost of freight to and from customer.